Whenever I write one of these restaurant reviews, I’m almost always traveling alone on business. But there are some places you’re just not meant to dine alone. 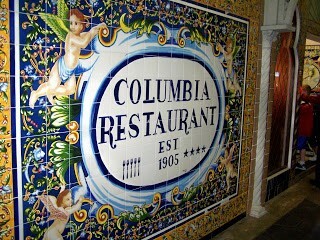 For example, the Columbia Restaurant. This isn’t a place to grab a quick bite. Dining here is an event. An occasion. It’s an immersion into Spanish culture, complete with flamenco dancers, elaborate Spanish artwork, and pitchers of mojitos handcrafted at your table. Columbia Restaurant is meant to be experienced with a group of friends or family. So when a whole group of us were actually traveling on business together, I knew we had to take advantage of it. Pass the tapas and the rum – it was going to be a fun night! The décor inside Columbia Restaurant is both old and huge. Extravagant and captivating, this is no hole-in-the-wall dive. 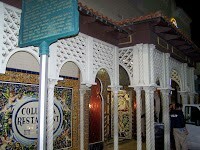 In fact, it claims to be the oldest restaurant in Florida and the largest Spanish restaurant in the world. Made up of 15 separate dining rooms, it occupies an entire city block in the heart of Ybor City, Tampa’s historic Cuban neighborhood. The moment you walk into the foyer, you know you’re in for a night of something special. 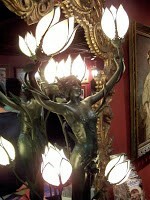 Thirty foot long mirrors, elaborate chandeliers, lampstands carved into the shape of sultry maidens, and noble paintings of the Old Country. One painting near the hostess stand was especially notable. 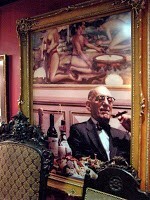 A sharply dressed older man leans back comfortably in his chair as he smokes a Cuban cigar. Surrounded by bottles of wine and plates of Spanish cuisine, he is living the life and he knows it. After being seated, our waitress came over and whipped up an entire pitcher of mojitos right before our eyes. 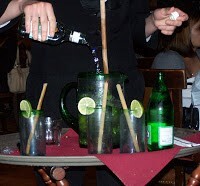 Each glass came garnished with a fresh slice of lime and a stick of sugar cane. Sure, you can order a mojito almost anywhere, but Columbia’s are the real deal. Pass the pitcher, this is going to be a fun night! I ordered an Estrella Damm to go with my meal, a beer imported from Barcelona, Spain. 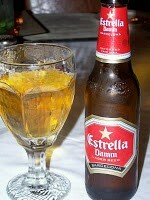 As I discovered on the label, Estrella means “star” in Spanish. A crisp, mildly hoppy pilsner, Estrella has none of that Eurotrash funk found in most beers from northern Europe. I ended up drinking about four before the evening was over. So at I this point, I hope I’ve convinced you that Columbia Restaurant offers a fun and sophisticated indulgence of Spanish culture. 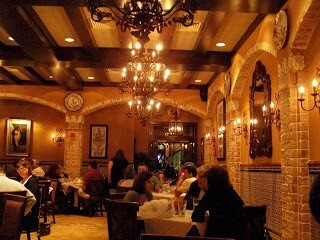 Well, I’m pleased to tell you that their Spanish and Cuban cuisine lives up to the atmosphere and hype. I’m still dreaming about their chorizo appetizer. A dish of thinly-sliced chorizo and caramelized onions with round crackers on the side. After a bite or two, I realized the chorizo and onions were so good, the crackers weren’t necessary. Choosing a main course was frustrating. The menu goes on page after page with each dish described in mouth-watering detail. Chicken, fish, rice, pork, beef. In every imaginable form. 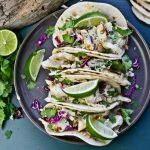 Having been on the menu for generations, this perfectly seared Gulf snapper comes smothered in a rich, dark gravy – almost like a mushroom sauce – and topped with sautéed onions, green peppers and toasted almonds. On the side came an overflowing dish of rice and peas and fried eggplant topped with fried Gulf shrimp. And on a night of this much decadence, you order dessert—even if you’re about to burst at the seams. So we ordered the Moros y Cristianos. Served in a round clay dish with half chocolate mousse and half Spanish custard. Sweet, yet light and smooth. The perfect finish to a perfect evening. No doubt about it. Dining at Columbia Restaurant is one indulgent night out. So eat, drink, and be merry.